Forward Luke Maye produced 30 points and 15 rebounds Wednesday night as eighth-ranked North Carolina won decisively on the road against an old rival, toppling the No. 1 ranked Duke Blue Devils, 88-72. North Carolina’s Cam Johnson also enjoyed a big game with 26 points and seven rebounds at Duke’s Cameron Indoor Stadium. Duke played most of the night without star freshman Zion Williamson, who fell and suffered a knee injury only 36 seconds into the action. He did not return. Subsequently, the Tar Heels ran solid halfcourt offensive sets and rolled behind Maye and Cam Johnson to a 10-point lead at halftime. North Carolina outscored Duke 17-5 in the first four minutes of the second half to take a 22-point lead. Johnson capped the streak when he hit a layup with 15:58 remaining to make it 59-37. Duke closed to within 13 points with 2:44 remaining, when Cam Reddish hit a three. But the Tar Heels steadied themselves and held on, breaking the Blue Devils’ nine-game winning streak. Williamson suffered the injury on his first touch of the game. On the wing, he drove into the key and went down when the shoe on his left foot came apart. Replay showed him clutching the back of his right leg above the knee. 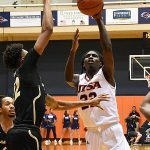 DaQuan Bracey scored six of his game-high 23 points in the final 1:35 Saturday to lift the Louisiana Tech Bulldogs to a 72-67 victory over the UTSA Roadrunners. 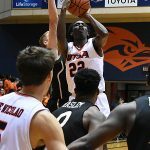 UTSA’s hopes of a regular-season title in Conference USA took a major hit, as the Roadrunners made too many mistakes down the stretch and hit only 5 of 29 for the game on three pointers. Old Dominion leads the C-USA title chase at 11-3. 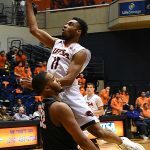 Western Kentucky, Southern Miss and UTSA are 9-5. UAB and North Texas are 8-6. 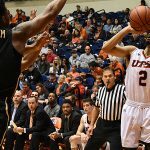 UTSA next will complete the regular season with four games in the C-USA’s new bonus play format. Group 1 teams in bonus play will include No. 1 Old Dominion, followed by No. 2 Western Kentucky, No. 3 Southern Miss, No. 4 UTSA and No. 5 UAB. A C-USA spokesman said earlier this week that No. 4 would host Nos. 1 and 5 and play on the road against 2 and 3. 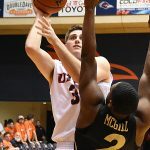 Which means, presumably, that UTSA will host Old Dominion and UAB and play on the road at Western Kentucky and Southern Miss. 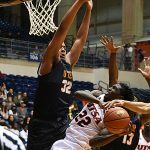 Trying to hold on for the regular-season title, Old Dominion is expected to host Western Kentucky and Southern Miss and play on the road at UTSA and UAB. The official pairings and schedule are expected to be released tonight. The Texas Longhorns emerged from a funk that lasted for more than three weeks with a 73-63 home victory Tuesday night over the 11th-ranked Kansas Jayhawks. The Longhorns entered the game on a two-game losing streak. They had lost five of their last six. But they registered their best win in Big 12 play by holding Kansas star Dedric Lawson to 13 points on 4 of 14 shooting. Combined, Lawson and Marcus Garrett went 5 for 18 as Kansas, a 14-time defending conference champion, lost its second straight game. On the other end, Texas played patiently and forced Kansas into too many fouling situations. Taking advantage, the Longhorns hit 21 of 23 from the free-throw line. Dylan Osetkowski scored 16 points to lead four Texas players in double figures. Kerwin Roach II had 15, Jase Febres 13 and freshman center Jaxson Hayes 12 for the Longhorns. With the win, Texas snapped a 10-game losing streak in the series against Kansas. 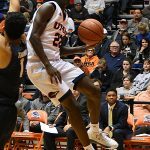 Adokiye Iyaye scored 12 points off the bench for UTSA. 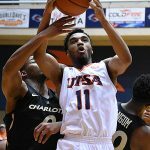 UTSA beat Charlotte 88-43 on Thursday night at the Convocation Center. 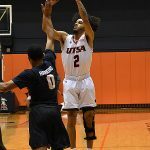 Jhivvan Jackson knocked down six three-point shots and scored a game-high 28 Thursday night against the Charlotte 49ers. 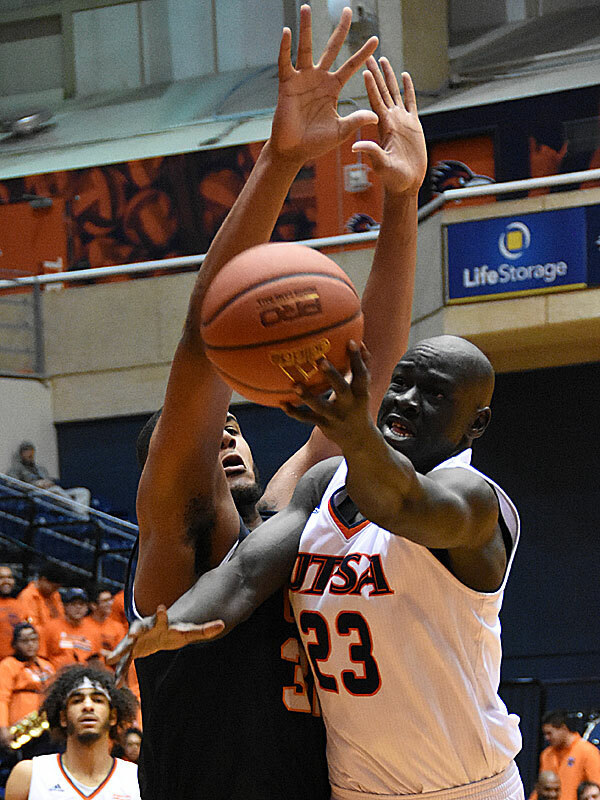 Atem Bior had 8 points and 12 rebounds off the bench. 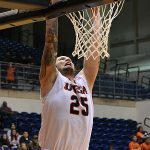 UTSA beat UTEP 75-65 on Thursday at the UTSA Convocation Center. 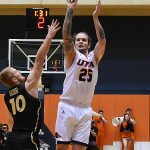 Byron Frohnen scored six points in UTSA’s 13-0 burst to start the game. Guard Jhivvan Jackson has returned from inury to average 20.5 points per game this season. – Photo by Joe Alexander, Jan. 3 at UTSA. 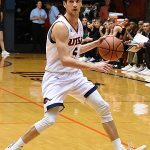 Last year, the UTSA Roadrunners set out on a nightly basis to push the pace and shoot the 3-pointer. 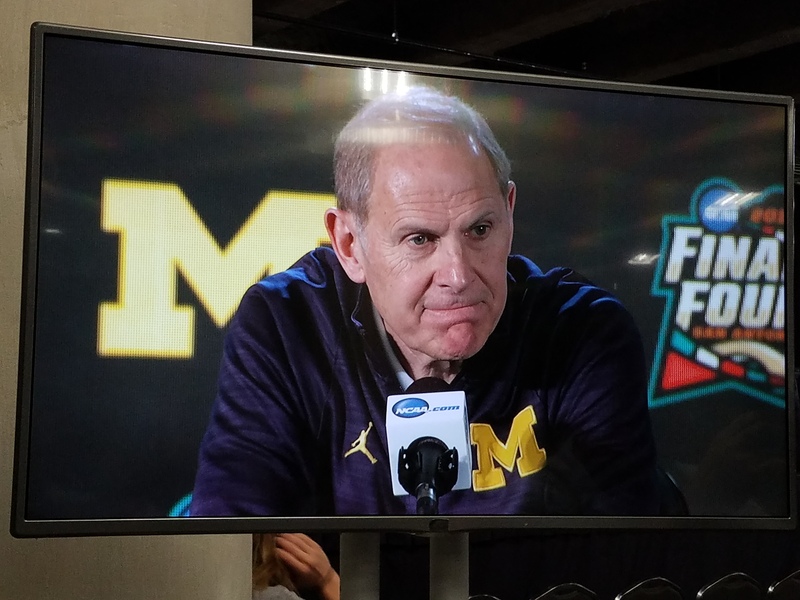 Even if the long ball was hoisted fairly early in the shot clock, that was OK, because they had enough threats to run and hoist field goal attempts with just about anyone. And with just about any degree of difficulty. 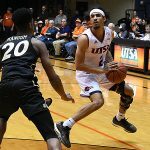 As UTSA enters Conference USA play tonight, hosting the UTEP Miners at 7 at the Convocation Center, the Roadrunners have established a different mindset. 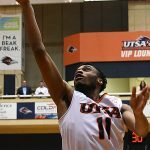 Jhivvan Jackson and Keaton Wallace are expected to fire away, as usual, but the Roadrunners have evolved into more of a team based on defense. 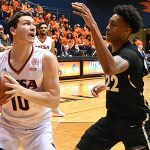 UTSA has held eight straight opponents to 42 percent shooting or less during a 6-2 streak that has given the team hope after an 0-5 start. Even the younger players have developed a good grasp on what is expected of them on a daily basis. “Really, we’ve spent a lot of time talking to our leaders about taking control of that, taking control of the defense,” Henson said. “That needs to be their identity. “Again, that was the thing we had to work through. Who are we? What gives us the best chance to win? Is that 90 possessions a game? Or is it being a great defensive team? 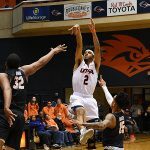 UTSA and UTEP will play back-to-back games to open C-USA play, a byproduct of a revamped scheduling system within the conference. The teams will meet again Saturday night in El Paso. 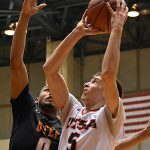 Texas State won its eighth game in a row Saturday night, playing on the road and downing UT Rio Grande Valley, 77-68. 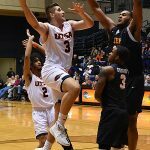 Within the winning streak, the Bobcats have won four straight on the road, claiming victories at Portland, UTSA, Texas A&M-Corpus Christi and UT Rio Grande Valley. Tre’Larenz Nottingham scored 19 and Nijal Pearson 16 for the Bobcats. Lesley Varner II had 20 for the Broncs. Trailing by 16 with 13 minutes left, the Broncs rallied to within six. 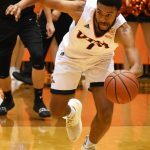 With about two minutes left, UT Rio Grande Valley had a chance to cut it to four twice on one possession, but Varner and Jaron Levi missed. 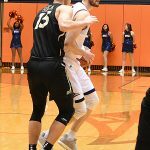 Eric Terry responded with a layup and Nottingham hit a free throw to put the game away for the Bobcats, who haven’t lost since Nov. 17 at Drake. Christian Peevy’s streak of consecutive free throws made ended at 24 on Sunday afternoon in Baton Rouge, Louisiana. 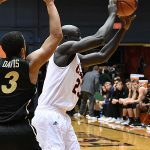 Peevy, a University of the Incarnate Word sophomore from Chicago, hit his first three in a game against the LSU Tigers. But he finally missed on the second of two with 9:52 left in the opening half during LSU’s 91-50 victory in the Maravich Assembly Center. 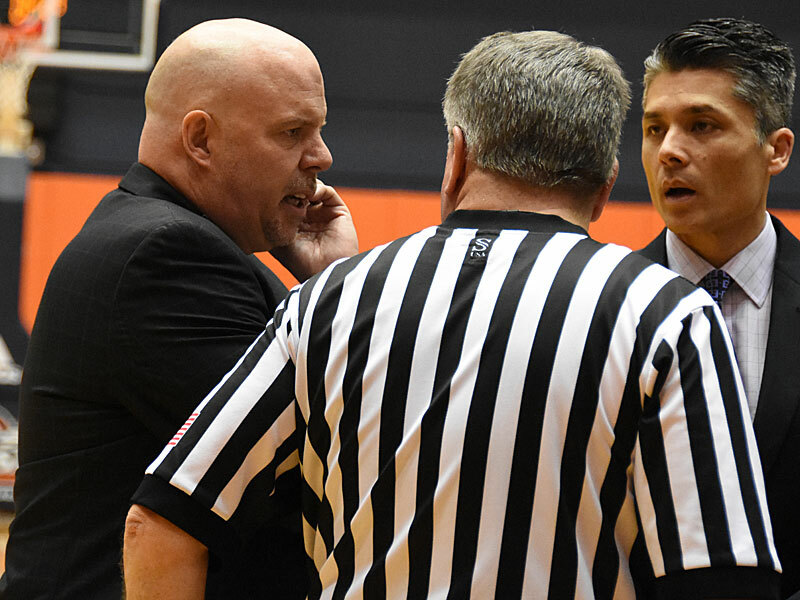 The Peevy streak included: 14 straight at Southern Illinois-Edwardsville on Nov. 25. Seven (in seven attempts) at home last week against Trinity. Finally, three at LSU. After his lone miss, he finished with six straight, giving him 9 of 10 for the game and 59 of 65 for the season (90.7 percent). Before the game at LSU, Peevy vowed to try to break the NCAA record for consecutive makes held by UIW assistant coach Darnell Archey. Archey made 85 in a row over parts of three seasons at Butler from 2001-03. 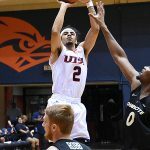 With Keaton Wallace and Jhivvan Jackson leading a rejuvenated offense, the UTSA Roadrunners blew out the NAIA Mid-America Christian Evangels, 104-74, Saturday afternoon. 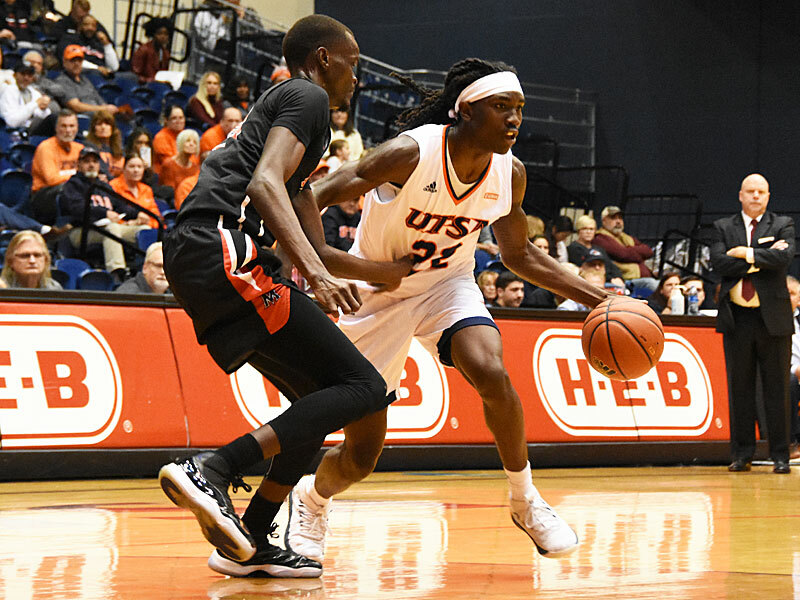 Yes, it was fun for the Roadrunners to win at home again, finally, after an 0-3 start at the Convocation Center. It also felt good to produce season-highs in points and field goal percentage (60.3). 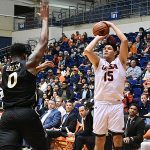 But more than that, UTSA coach Steve Henson commended the players’ focus and work ethic in practices since a deflating 69-68 home loss to Texas State last Saturday. 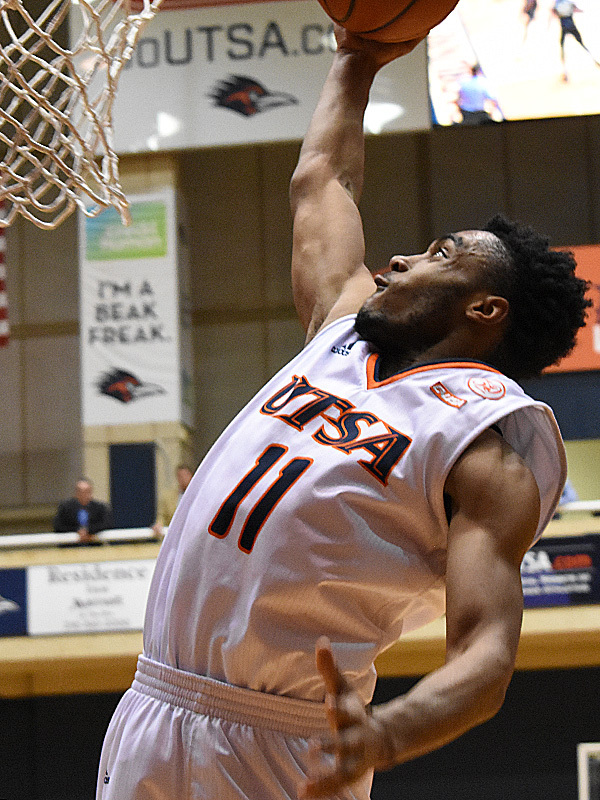 UTSA — Wallace scored a career-high 35 points on 12 of 16 shooting. He was one off the school record with nine threes. Jackson produced a season-high 28 on an 11-for-21 effort. Mid-America Christian — Char Beauregard, Jr., scored 15. Daniel William and Justin Bogle had 13 apiece. Henson shuffled his starting lineup, giving Jackson his first start of the season. 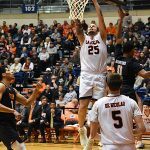 Jackson responded with a 25-minute performance that included six rebounds, three assists and a team-high four turnovers. The move seemed to create space on the floor for Wallace, who was getting open looks consistently. 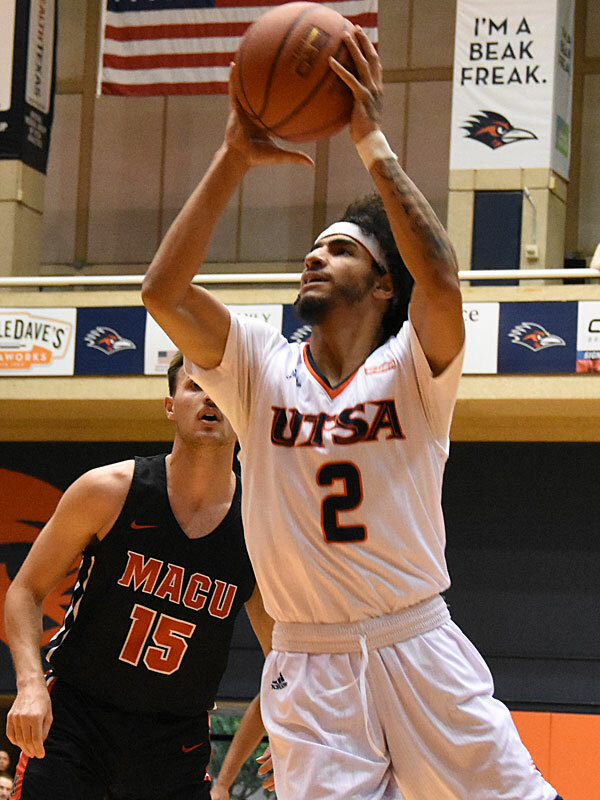 Jhivvan Jackson produced a season-high 28 points against Mid-America Christian.